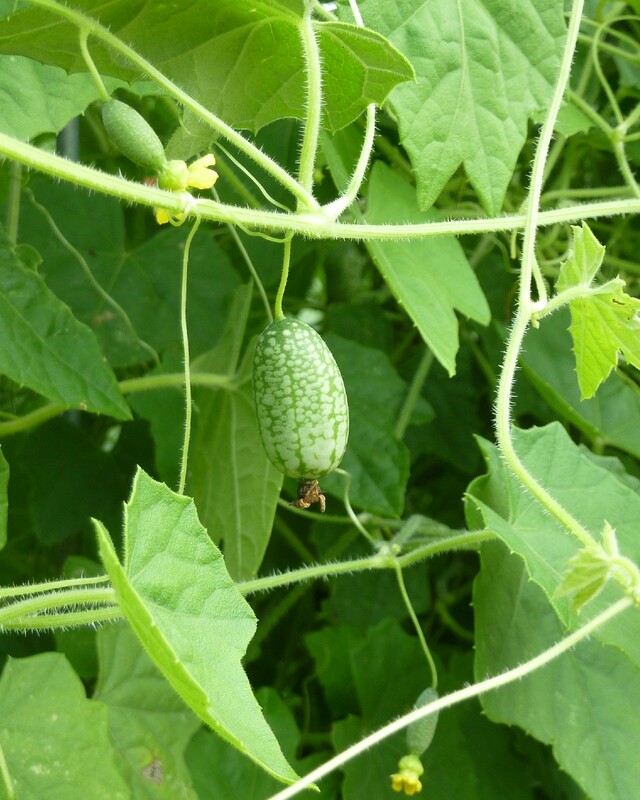 Those of you who’ve been reading my blog entries for a while know that my favorite vegetable plant (that I only discovered last year) is Melothria scabra, the mouse melon or Mexican sour gherkin. Why do I like mouse melons so much? Well, first of all, they are adorable. Usually when I’m asked to grasp at a description, I say that they taste like cucumbers (one-bite snack-perfect crunchy slightly-sour cukes) but look like tiny watermelons. They are in fact neither melons nor cucumbers: not in genus Cucumis or Citrullus nor from the same part of the world originally (cucumbers probably originated in Asia, melons and watermelons in Africa; mouse melons are from Central America), but they do belong to the family Cucurbitaceae (you can see a family resemblance in the dainty leaves and itty bitty yellow flowers). Aside from cuteness and snackability, I like them for their vigorous growth. The plants have few insect problems (in fact they seem to be a hangout for beneficials) and so far I haven’t lost any to the bacterial wilt and powdery mildew that kill cucumbers right and left in the same garden. They are a little hard to get started; germination (inside in April or outside in May) is pretty reliable, but those delicate stems and tendrils are subject to damage from cold or rough handling. My plan next year is to hold them in pots longer, until they are really ready for the big bad garden, but give each pot its own small trellis, because a tray of mouse melon seedlings is a tangled disaster in the making. They want to climb, but they want to intermingle even more. The plants growing on the cattle panel arbor in the demo garden had a period of wanting to bush out down at the base, but now they are climbing pretty well. And just as I anticipated, we can now pick mouse melons overhead from under the arbor. We picked a lot this week, so I finally had enough to try pickling them. I made refrigerator pickles (not canned, must be kept in fridge, last a few weeks if you don’t eat them before that) and I’m not going to include a recipe since if you don’t already pickle you can search one out and if you do pickle you are better at it than me. But they turned out quite tasty. The last reason I like mouse melons, that may appeal to some readers as well? 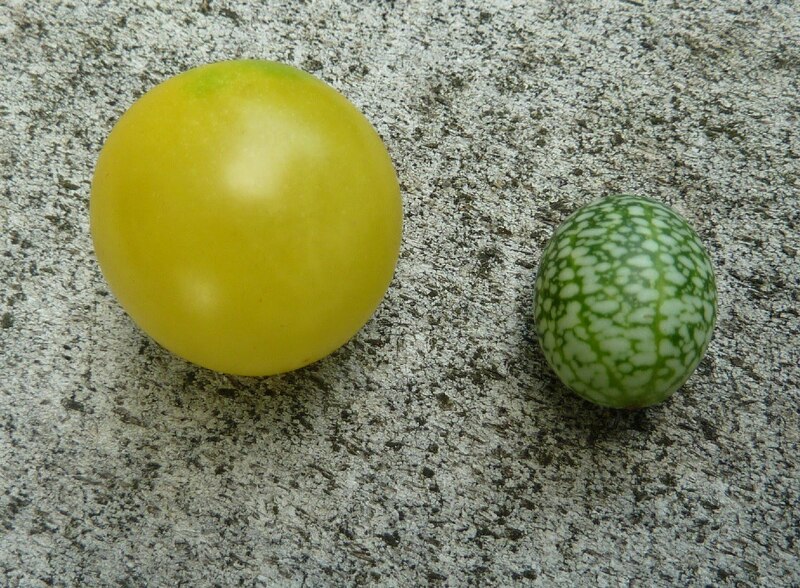 If you grow them (look for the seeds under the name Mexican Sour Gherkin), you may well be the first on your block (or in your town) to do so. Although if I have anything to do with it, that won’t be the case for long. A million mouse melons for Maryland? Maybe. What an intriguing possibility–pickled mimi-melons! My mouth waters! I used to pickle watermelon rind, but modern varieties have so thin rind that processing it for pickles is not worth the effort, at least for me. I bet there's an heirloom watermelon out there just waiting for you to pickle its rind. 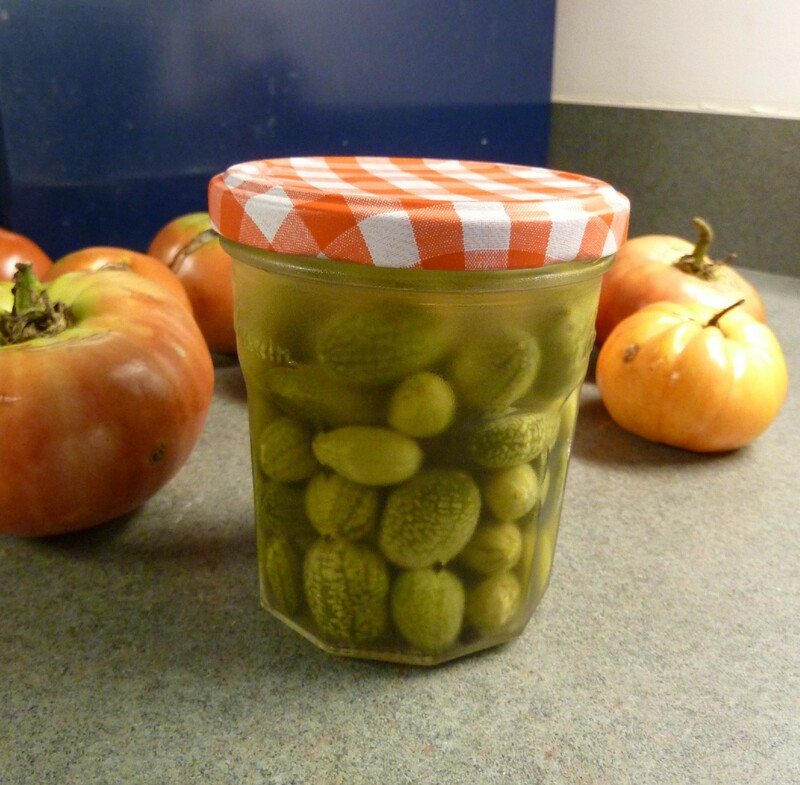 I'm very pleased with how the mouse melon pickles turned out! Maybe I'll take the easier way out, Erica, and grow some pickling cukes. We still have the large pickling urn stored away smewhere–I think. Maybe I should check that out first. BUT HOW IS INSIDE THE FRUIT??? red? And what climatic requeriments have the plant to Vegetative an flower fase. Seeds started in May outside would produce fruit in August; seeds can be started inside in April for earlier fruit. 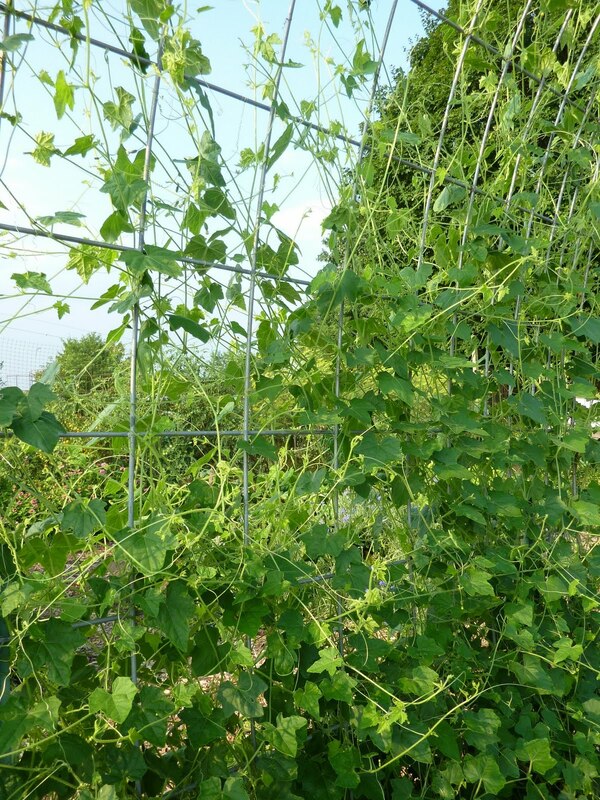 Outside temperature should be over 60 F at night; plant is not hardy and will die at frost. Are there BLACK mouse melons? Mine look just like it, but are black. Never heard of or seen such a thing, but who knows. Did you plant them? Watermelon rinds were my first pickle, so delicious with soft cheese and crusty bread! does anyone know what insect polinates the mouse melons? Any of the smaller bees. I've seen lots of bumblebees on them, a few honeybees, some wasps. if they are black they are a laxative. so be careful! I did a lot of looking about these because i found them growing up my black berry bushes, and they smelt like cucumbers when crushed. only eat the green ones, and then,only if you are sure what it is. Am Giannis Doskaris, from Poros isl., Greece. Αμ αν Αgriculturist, and I want to cultivate mouse mellon and I want to know what is the harvest per plant (in kilos). I'm afraid I don't have this data, sorry! It might be a kilo per plant per week, but that's a wild guess just based on the harvesting I've done. My friend just bought a new house and found these growing in her backyard. She wants to know when the harvest time is? They are starting to ripen now – it's really the size that matters more than anything else. About 3/4 to 1 inch long. okay, thank you so much. We both have been trying to research these (she lives in Virginia and I live in North Carolina) and we both think we could sell these at local Farmer's Markets. Do you sell yours, and if so, what is your going price. Also, is there a difference between all the different 'names' that we've found online, such as Pepquitos, Mini Melons, and Mexican Sour Gerkins? Thanks for all your help! I've never grown enough at a time to try selling them, but I bet there would be a market, especially if you offer free samples. As far as I know all the names equal the same plant. A friend did buy some seeds called “Mexican Mini Watermelon” that turned out to be watermelon seeds (I'm growing them out now to see what results) but everything else I see under that name online is actually mouse melons.